Hungry for some seafood? 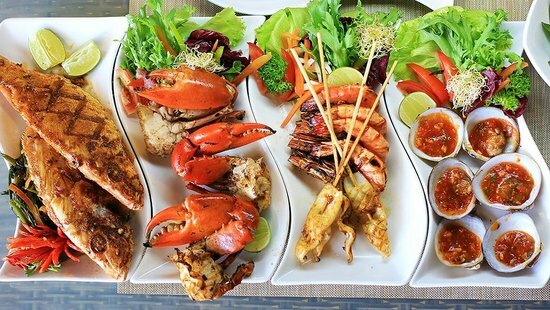 Jumia Food, shares some of the best spots for the absolute best and most delicious, mouth-watering seafood meals. Here are 4 of them. This is a popular seafood spot in Lagos that offers some of the best seafood in the country. It’s a pretty and decent restaurant with a nice and simple sea-themed décor and ambiance. Their seafood is fresh and delicious with diverse selections to titillate your taste buds and whet your appetite. Additionally, they also have a great customer service to go along with the awesome dining experience they provide. This is another great seafood restaurant located in Abuja. They offer a unique dining experience to guests with absolutely delicious Chinese and Asian cuisines, as well as seafood dishes. Their meals are fresh, healthy and cooked with high quality ingredients that help to enhance guests dining experience. Think of Ocean Basket and think of delicious, mouth-watering seafood dishes offered at great prices. Many argue that this is probably the best seafood place in Nigeria and well… it’s hard to disagree. The restaurant has beautiful, seafood oriented décor, with comfortable, relaxing furniture and a cool ambiance. They serve strictly fresh, juicy and delicious seafood here, and they also have a sushi menu. Their staff are nice and welcoming, and you’re sure to have a delightful dining experience here. This is a nice restaurant located in Abuja that offers delicious and affordable seafood dishes, which are sure to give you a lovely dining experience. Its furniture and décor are nice and comfortable; and they also serve other delicious local and international cuisines at impressively affordable prices.